A couple of shifts ago, my partner and I were assigned to a nonemergency fall. I was attending. We arrived to a well-kept little house on a nice little street. A man across the street from the call address stopped mowing his lawn and walked over to the ambulance when we pulled up. “They’re both deaf,” he said with a shrug. “She fell down and her husband asked me to call.” I nodded, smiled, and thanked him. In order for my dispatch to assign me to a fall victim without the use of firefighters, flashy lights, and loud sirens, the fall must be minor. I expected a lift assist, as a matter of fact. This guy's unperturbed demeanor solidified that notion in my mind. The EMS gods have repeatedly tried to teach me that I can’t prejudge calls. After 20ish years in EMS, you think I would get this lesson. Nope. Inside the house, I found an 80-something year old female who had fallen from a standing position to a carpeted floor. She had caught her foot on one of her dogs and it tripped her. She fell kind of across an ottoman and onto the carpet. She had an angulated distal tib-fib fracture. (Yeah. Paramedics shouldn’t diagnose. Whatever. I could see that this leg was broken.) The angle of the fracture was accompanied by a laceration, making this an open fracture, but the bone wasn’t sticking out. You've heard of a Colles' Fracture, nursemaid fracture, and so on? 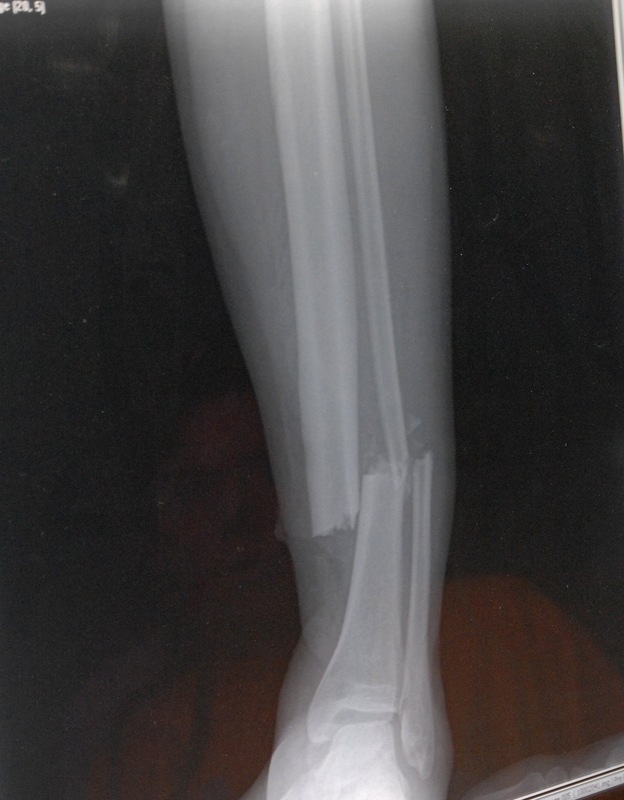 This is called a "Janitor's Fracture." That's because you don't need medical school to read the x-ray. A janitor could walk by and say: "That's broken..."
She was a nice lady. She was deaf, and couldn't/wouldn’t speak. (I found out later that some deaf people can vocalize, but are embarrassed by the “deaf voice” so they choose not to speak.) She also couldn’t lip read, so we communicated by writing notes on my notepad. Her husband was also deaf. He could read lips, sign, and spoke. He spoke quite loudly. Like, at the top of his lungs. Dude bellowed his answers like he was in the middle of an artillery barrage or something. It was endearing. I honestly liked both of them. I performed a head-to-toe check of the female patient. The distal leg injury appeared to be her only problem. It wasn’t distracting her, so I was confident that nothing else was severely injured. Her vital signs were fine, as well. So my priority was extrication from the house and transport to the hospital. Extrication would go better if the nice deaf lady was premedicated, so I sent my partner to fetch the narcotics. I started an IV and her husband screamed a list of prescription medications at me while we waited. We dosed the patient with 100 micrograms of fentanyl and waited several minutes for the medication to take effect. When I saw her release a subtle little sigh and relax a bit, my partner and I straightened and splinted her leg with a SAM splint with kerlix. She maintained distal pulses after splinting. After that evolution was done, we gave her a minute to settle herself and then moved her to the pram. In the ambulance, I could tell that my patient was still rather uncomfortable. I gave her a second hundred-microgram fentanyl dose. I spent several minutes getting everything set for the transport. I rechecked her vital signs, checked the distal circulation of her foot, called to set up the hospital, and generally made sure I wasn’t missing anything. I wrote her another note on my pad: Is your pain level tolerable or would you like more pain medicine to make you more comfortable? If she wanted more medication, I was prepared to switch to four-milligram doses of morphine. She took the note from my hand and held it in front of her, close to her face, so she could read it through her myopia and the vibrations of driving down the road. I didn’t think it was that long of a note. I looked at her more closely to see what the hell was going on. Did I spell something wrong, or what? I smiled. Perfect. My written question was answered. Therapeutic dose achieved. As a matter of fact, I needed to monitor her more closely being that she was elderly and I had snowed her. I put on pulse oximetry and oxygen via nasal cannula. I made sure she was comfortable, but not overdosed. She woke easily to a light squeeze of her shoulder. She was exactly how I would want my mother or grandmother to be if they had fallen and gotten their foot to point the wrong direction, with the bone through the skin. So sleep away, nice lady. At the hospital, she woke to help move herself from the pram to the hospital bed and go through the ED staff introductions. Then she fell back to sleep. Awesome. This is exactly the kind of call I am talking about when I say that the first rule of EMS is to help people; make someone’s situation a little better. Mission accomplished.